Showing results for tags 'cheesecake'. Celiac.com 10/16/2013 - A crust of almonds and almond meal highlight this delicious, gluten-free version of a traditional cheesecake. Ingredients: Filling: 1 pound cream cheese, 2 (8-ounce) blocks, softened 3 whole eggs 1 cup sugar ½ teaspoon vanilla extract 2 teaspoons grated lemon peel Nut Crust: ¾ cup finely crushed almonds ¾ cup almond meal 2 tablespoons granulated sugar 2-3 tablespoons butter, room temperature Directions: Heat oven to 300F. Place all nut crust ingredients in a mixing bowl and mix well. Lightly coat the bottom and sides of an 8-inch springform pan with oil. Pour the nut crust mixture into the pan. Use the bottom of a measuring cup or glass to press the crumbs down into the bottom and 1-inch up the sides of the pan. Place crust in oven and bake about 5 minutes, or until the crust is slightly browned. Remove and cool. Cheesecake Directions: Heat oven to 300 degrees F. For the Filling: In the bowl of an electric mixer, beat the cream cheese on low speed for 1 minute until smooth and free of any lumps. Gradually add sugar, lemon zest, and vanilla. Add the eggs, 1 at a time, and continue to beat slowly until combined. Beat 1-2 minutes until creamy, but not over-mixed. Pour the filling into the crust-lined pan and smooth the top with a spatula. Bake at 300 degrees F for 1 hour. The cheesecake should still jiggle, so be careful not to overcook. Remove and allow to cool in pan for 30 minutes, then place in the refrigerator, loosely covered, for at least 4 hours. Loosen the cheesecake from the sides of the pan by running a thin metal spatula around the inside rim. Release the side of the pan and set aside. To slice the cheesecake, dip a thin, non-serrated knife in hot water, make a cut, then wipe blade dry after each cut. Garnish slices with berries or a dallop of lemon curd. This recipe comes to us from Lisa Bell. Serves 12-16 Ingredients/Utensils: Reynolds Wrap large size, heavy-duty foil Roasting pan that a 9” springform pan can fit inside with 1” space on all sides (can be “disposable” one) 4 - 8 oz cream cheese, softened 1 ¾ cups white sugar 5 eggs 1 egg yolk 1 cup unsalted butter, softened 1/8 cup cornstarch 1 ½ cups sour cream ½ teaspoon gluten-free almond extract ½ cup heavy whipping cream 1 teaspoon gluten-free vanilla extract ½ teaspoon nutmeg 1 cup chopped pecans (optional) Directions: Bring all ingredients to room temperature. Preheat oven to 375ÂºF. Wrap outside of 9” springform pan with foil. Generously butter inside of pan. In large food processor, beat cream cheese and butter until smooth. Add sugar and cornstarch. Blend in sour cream. Transfer to an extra large mixing bowl. With electric mixer, add whipping cream, and almond and vanilla extracts. Blend in eggs and egg yolk ONE AT A TIME, mixing and scraping bowl with spatula thoroughly between each addition. Pour batter into pan. Place pan in roasting pan and add water (about 4 cups to prevent cracks) outside of the springform pan. Bake on center rack for 70 minutes. Turn off oven and let cool with the door open for 1 hour. Remove springform pan from water bath and chill for at least 3 hours before removing the cake from the pan. Dust with nutmeg, and top with chopped pecans, if desired. Celiac.com 04/29/2017 - Spring is cherry blossom season, which means that actual cherries are still far enough off that we'll have to leave their deliciousness ahead, and turn to their canned cousins for this recipe. Turns out, that's not a bad thing. 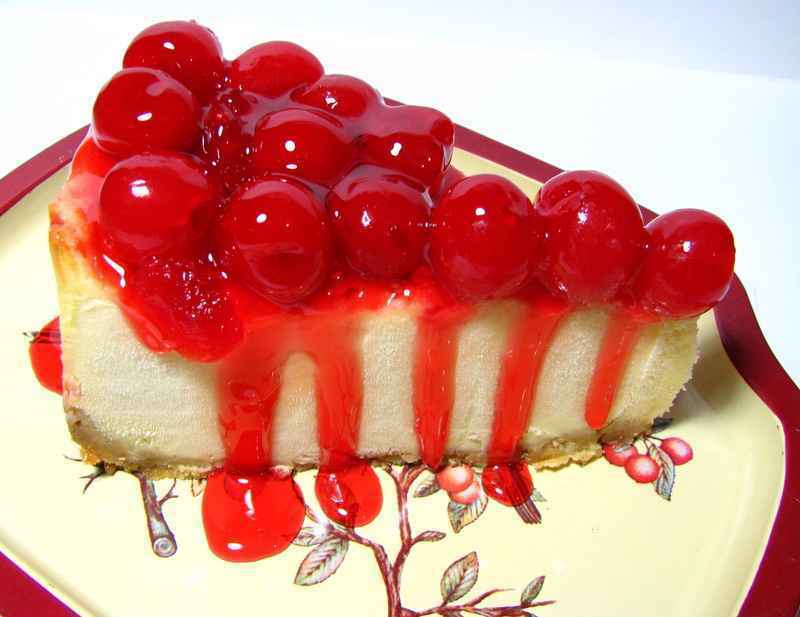 Canned cherries make a tasty cornerstone to this super quick, super-easy no-bake cheesecake. Enjoy! Ingredients: 1½ cups fresh ground almond meal ⅓ cup packed brown sugar ½ teaspoon ground cinnamon ⅓ cup butter, melted 2 (8 ounce) packages cream cheese 1 pint heavy whipping cream 1 tablespoon lemon juice ⅓ cup white sugar Canned cherries, for topping, as desired Directions: In a small bowl, stir together the almond meal, brown sugar and cinnamon. Add melted butter and mix well. Press into the bottom of an 8 or 10 inch springform pan. Chill until firm. In a medium bowl, beat together the cream cheese and lemon juice until soft. Add whipping cream and beat with an electric mixer until batter becomes thick. Add the sugar and continue to beat until stiff. Pour into chilled crust, and top with pie filling. Chill several hours or overnight. Just before serving, remove the sides of the springform pan. Top with cherries and serve chilled to people you really like. Celiac.com 12/04/2014 - Cheesecake is one of my favorite desserts. This version incorporates holiday eggnog for a rich, delicious cheesecake that’s sure to put a smile of the faces of most anyone. It makes a great potluck item that will have people asking for more. Ingredients 3 8-ounce packages cream cheese 1¼ cup almond meal (or finely ground raw almonds) ⅓ cup butter 3 tablespoons sugar (for crust) 1 cup granulated sugar 3 tablespoons gluten-free flour or potato starch ¾ cup whole milk eggnog 2 eggs 2 tablespoons rum 1 teaspoon ground cinnamon 1 teaspoon ground nutmeg Directions: Heat oven to 350°F (180°C). Crust: Melt butter and combine with almond meal and sugar, mix well until all butter is absorbed. Spread into an 8" or 9-inch springform pan, pushing into corners and on edges. Bake crust for 10 minutes or until slightly browned. Remove from oven, and set aside. Cheesecake: TIP: Place a small ovenproof pan of water in the oven when baking. This will help to ensure a moist cheesecake. In a large mixing bowl, combine cream cheese, sugar, flour, eggnog, eggs, rum and cinnamon and nutmeg. Use a mixer or wire pastry cutter to mix well. Pour mixture into pre-baked crust and bake at 350°F (180°C) for 45-50 minutes, or until cake is barely firm in the center, but still jiggly. Remove from oven and loosen cake rim. Cool cake completely and remove ring of the springform pan. Cover lightly and refrigerate until completely chilled before serving. Celiac.com 11/21/2014 - This holiday twist adds pumpkin and spice to one of our most popular gluten-free cheesecake dessert recipes. It’s sure to be a big hit with cheesecake lovers, pumpkin pie lovers and, most importantly, gluten-free eaters looking for a delicious dessert. Ingredients: 1 pound cream cheese, 2 (8-ounce) blocks, softened ½ can solid-pack pumpkin (about 8 ounces) 3 whole eggs 1½ tablespoons potato flour 1 cup sugar ¾ teaspoon pumpkin pie spice ¾ teaspoon vanilla extract Almond Meal Crust: ¾ cup finely crushed almonds ¾ cup almond meal 2 tablespoons granulated sugar 2-3 tablespoons butter, room temperature Almond Meal Crust Directions: Place all nut crust ingredients in a mixing bowl and mix well. Lightly coat the bottom and sides of an 8-inch springform pan with oil. Pour the nut crust mixture into the pan. Use the bottom of a measuring cup or glass to press the crumbs down into the bottom and 1-inch up the sides of the pan. Place crust in oven and bake about 5 minutes, or until the crust is slightly browned. Remove and cool. Cheesecake Directions: Heat oven to 300 degrees F. In the bowl of an electric mixer, beat the cream cheese on low speed for 1 minute until smooth and free of any lumps. Add pumpkin, and beat slowly while adding sugar, pie spice, potato flour and vanilla. Add the eggs, one at a time, and continue to beat slowly until combined. Beat 1-2 minutes until creamy, but not over-mixed. Pour the filling into the crust-lined pan and smooth the top with a spatula. Note: I sometimes have extra filling. If so, I just use what I need and discard the rest. Bake at 300 degrees F for 1 hour. The cheesecake should still jiggle, so be careful not to overcook. Remove and allow to cool in pan on a wire rack for 30 minutes, then place in the refrigerator, loosely covered, for at least 4 hours. Loosen the cheesecake from the sides of the pan by running a thin metal spatula around the inside rim. Release the side of the pan and set aside. To slice the cheesecake, dip a thin, non-serrated knife in hot water, make a cut, then wipe blade dry after each cut. Celiac.com 11/07/2014 - This gluten-free lemon cheesecake recipe is great to make for a dessert or special treat for your family and friends. It is one of my all time favorites! Ingredients: 2 cups almond meal 1/2 stick butter 19 oz. cream cheese 1 cup sugar 3 eggs 1 tablespoon vanilla 1 tablespoon lemon zest 1 tablespoon lemon juice Directions: Mix almond meal and room temperature butter with your and until it is evenly mixed. Use your hand to coat the bottom of a pan with the almond meal mixture until it is even, and then bake crust at 325F for 10 minutes, or until it is golden brown. Grate the skins of 2 lemons to make lemon zest. Add the cream cheese to a mixing bowl and mix until fluffy, then add the sugar, eggs, vanilla, lemon zest and lemon juice and continue to mix for 1 minute. Spoon the mixture into the pan with the crust until just below the top. Put the cake onto a cookie sheet that is covered with a layer of water and bake in the oven for 30 minutes at 350F. Chill and serve. This recipe comes to us from Donna Millheim. Kitchen Utensils: 1 small plastic zipper-style sandwich bag small microwaveable glass or cup (for melting the butter) ¼ cup measure 1 teaspoon measure 1 tablespoon measure 9.5" round springform cake pan, 3" deep 3 quart mixing bowl Butter knife (for cutting cream cheese) Handheld electric mixer Cookie sheet (or other flat sheet large enough to hold the springform pan in the oven; I use a pizza pan) Frosting spatula (for scraping sides of bowl and later for spreading topping) Knife or cake server for cutting cake Crust Ingredients: 1/3 box of gluten-free soft chocolate cookies (7.25 ounce box; you can vary from this slightly - I use Country Choice Certified Organic Double Fudge Brownie Cookies) ¼ cup butter (equal to half a stick of butter) Cheesecake Ingredients: 1 cup sugar 3 - 8 ounce packages cream cheese, softened ¼ cup cocoa 4 eggs 2 teaspoons vanilla flavoring Sour Cream Topping Ingredients: 1 cup dairy sour cream (8 oz container) 2 tablespoons sugar 2 teaspoons vanilla Make the Crust: Preheat oven to 350F. Place all of the cookies into the zipper bag. Place the butter into a glass or cup and melt it in the microwave for 30 seconds. Pour the melted butter into the bag on top of the cookies (shut the bag) and scrunch the mixture (using one hand, outside the bag) until it is crumbly. Empty the mixture out of the bag and into the springform cake pan, then turn the bag inside out. Place your hand into the (now clean) inside of the bag, and use the knuckles of your hand (you are using the plastic bag as a type of glove to keep the mixture from sticking to your hand) to press the cookie mixture flat into an even layer in the bottom of the pan. Make sure you cannot see the pan through the cookie layer. You can go a little bit up the sides of the pan, but try not to go more than a fraction of an inch higher than the depth of the cookies. Bake for 10 minutes and set aside to cool while you mix the cheesecake ingredients. Mix The Cheesecake Ingredients: Reduce the oven temperature to 300F. Cut the cream cheese into half-inch wide slices as you open the package, dropping them into the mixing bowl. After each package has been dropped, beat the cream cheese until it is fairly smooth. Once all three packages are smooth, gradually beat in the sugar (a quarter cup at a time) and then the cocoa (a little bit at a time, or it will form a chocolate-colored dust cloud) until fluffy. Add the vanilla and then beat in the eggs, one at a time. Bake the Cake: Place the springform pan onto the cookie/pie sheet. This is to contain any "weep" from the springform pan during baking. Pour the cream cheese mixture into the springform pan and place it immediately into the oven. Bake until center is firm, about 1 hour. The cake will fall slightly near the end of baking (and possibly crack); this is normal. Leave the cake in the springform pan for now. Topping: Mix the sour cream topping ingredients together with a fork until well blended and uniform in color. Spread this on top of the cheesecake. Cover and refrigerate at least 3 hours but not longer than 48 hours (not that its going to last that long - yum!). Once youre ready to eat it, open the springform and remove it, but leave the cake in the pan. The springform should come away cleanly, as the mixture shrinks slightly during baking. You can put the springform back onto the pan if you need to transport the cake. Anyone can seriously make this...so easy, light(well, kind of), fluffy, and smooth!!! You will not be disappointed. Ingredients 1 gluten free pie crust (see recipe under my other blog posting) 2 packages (8 oz) cream cheese, softened shopping list 1 package (3 oz) Pistachio flavored gelatin shopping list 1 package (16 oz) vanilla CANDIQUIK Coating shopping list 1 container (8 oz) whipped topping, thawed How to make it: Melt Vanilla CANDIQUIK according to directions on package. Blend Candiquik in a large bowl with gelatin powder and cream cheese until smooth. Fold in whipped topping until well mixed. Spread cheesecake mixture in pie crust (optional: top with whipped cream and fresh pistachios) Enjoy!! Raw foods are increasing in popularity with health food enthusiasts everywhere for their health benefits and the divine recipes. Most raw foods are also naturally gluten-free. 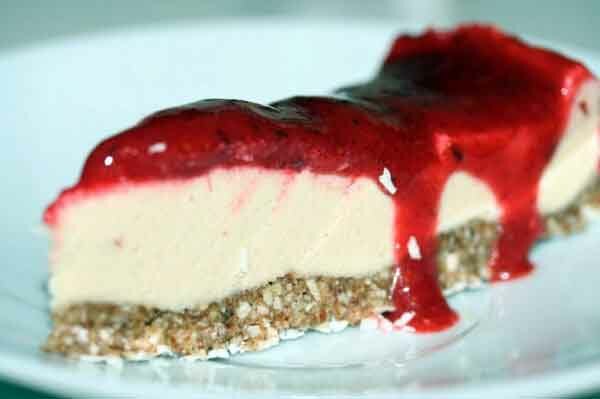 The following gluten-free, dairy-free, soy-free, egg-free, raw cheesecake is a must try. Personally, I think raw cheesecake is better than the real thing. However, if you are a huge cheesecake fan, you may have to get creative and remember that this is a raw dessert and requires absolutely zero cooking, and therefore is really no comparison to an authentic cheesecake. However, this raw cheesecake is even healthy enough to eat for breakfast, something that can't be said for traditional cheesecake. Finding the ingredients may be the hardest part of making this raw cheesecake. Many items can be found at most health food stores. The entire preparation process takes less than 30 minutes (not including the nut soaking). Ingredients: (Serves 12) 2 cups macadamia nuts 1 1/2 cups cashews 1/2 cup pitted Medjool dates 1/4 cup dried coconut 6 Tbs. coconut oil, melted but not to a boil 1/4 cup lime juice 1/4 cup raw agave nectar 1/2 sun-dried vanilla bean 3 cups mixed berries, such as blueberries and raspberries Himalayan salt Preparation: Place macadamia nuts in large bowl, and cover with cold, filtered water and pinch of salt. Place cashews in separate bowl, and cover with cold, filtered water, and pinch of salt. Soak nuts 4 hours, then rinse, drain, and set aside. Directions: Pulse macadamia nuts and dates in food processor to a sticky crumb-like consistency. Sprinkle dried coconut on bottom of 8-inch pie pan. Press macadamia nut mixture onto coconut to make crust. Place cashews, coconut oil, lime juice, agave nectar, and 6 Tbs. water in bowl of food processor. Scrape seeds from vanilla bean into food processor bowl, and purée until smooth. Pour mixture onto crust, and freeze 1 to 2 hours, or until firm. Remove from freezer, slice while frozen, and transfer to serving platter. Defrost in fridge 1 hour, or on counter top 30 minutes; top with berries; and serve. This recipe comes to us from Carolyn Mann. Preheat oven to 350F. Crust Ingredients: 1 ¼ cup finely crushed gluten-free graham crackers ½ cup finely chopped pecans 2 tablespoons melted butter Crust Directions: Combine gluten-free graham cracker crumbs, pecans and butter in a bowl and mix well. Firmly press mixture into the bottom of a 9 inch spring form pan that has been sprayed with nonstick cooking spray. Place crust in freezer while preparing the filling Filling Ingredients: 2/3 cup non-fat plain yogurt 2 (8 oz) packages light cream cheese softened 1 ¾ cups canned pumpkin 2 eggs ½ cup sugar ½ cup brown sugar 1 ½ cups nonfat evaporated milk 2 teaspoon ground cinnamon ¼ teaspoon ground cloves 1 teaspoon ground ginger 1/8 teaspoon salt 1 teaspoon vanilla Filling Directions: In a medium bowl, beat yogurt and cream cheese until creamy. In a separate bowl, combine remaining filling ingredients and beat until creamy. Stir into cream cheese mixture and beat until well mixed and creamy. Pour filling into crust and bake for 2 hours, or until middle slightly jiggles when tapped. Cool on rack, and then cool in refrigerator at least 4 hours before serving. Garnish with whipped topping and a sprinkle of cinnamon (optional). Makes 16 servings. This recipe comes to us from the Notte family. Ingredients: ¼ pound gluten-free sweet butter 1 ½ cup sugar 32 ounces whipped gluten-free cream cheese 16 ounces gluten-free sour cream 2 tablespoons corn starch 1 teaspoon gluten-free vanilla 1 ½ teaspoon lemon juice 5 eggs Directions: Let cream cheese, sour cream and butter stand at room temperature for 1 hour. Cream together the butter and the sugar. Mix in cream cheese then add sour cream. Add remaining ingredients except eggs and mix until smooth. Beat each egg individually and mix into batter one at a time (you can mix by hand or with a mixer on the lowest speed.) Pour the mixture into a 10 inch greased spring form pan. Line the pan with aluminum foil. Place the spring form pan into a large roasting pan that is half filled with hot water. Bake in a preheated 375F oven until golden brown and hour to an hour and a half. When it is golden brown, turn off the oven and let stay in oven for another hour. Remove spring form pan from oven and refrigerate until cold. Remove from pan and serve. This recipe comes to us from Linda Sowry. Ingredients: Mazola no stick cooking spray 2 packages (8 oz each) reduced calorie cream cheese, softened 1 cup sugar ½ cup milk 3 eggs ¼ cup Argo or Kingsfords corn starch 2 teaspoons vanilla extract 1 can (8 oz) crushed pineapple in juice, drained, juice reserved Cinnamon Spray 9-inch square baking dish with cooking spray. In blender combine cream cheese, sugar, milk, eggs, corn starch, vanilla and reserved pineapple juice. Blend 1 minute or until smooth, scraping down sides once. Pour into prepared baking dish. Spoon pineapple evenly over top (pineapple sinks into batter). Sprinkle with cinnamon. Bake in 300F oven 50-60 minutes or until set. Cool on wire rack 1 hour. Refrigerate. Makes 12 servings. The following recipe comes to us from Phil Walker. Base: 75g/3 ounces of butter or willow at room temperature 50g/2 ounces of margarine also at room temperature 60g/two and a half ounces caster sugar 175g/6 ounces of gluten-free flour 25g/1 ounces of corn flour Draw all ingredients together with hand, until a soft paste. Grease and line bottom and sides, of a 25.5cm/10 inch spring form cake tin, making sure the baking parchment, stands 1 inch higher around the sides than the tin. Press mixture evenly into tin. Set oven to gas3/325f/170c bake for approximately 40 minutes until golden brown, and just firm, to touch, cool completely. Filling 9.5 ounce bottle of Key Lime Jelly made up to half a pint with boiling water, and juice of 1 lime or 2 tablespoons of lime juice. 225g/8 ounces Philadelphia cream cheese, or equivalent. Beaten a little with a wooden spoon to soften Half a pint of double cream loosely whipped. When jelly is half set, whip everything together, reserving 3 or 4 tablespoons jelly to glaze. Tip into cooled base, glaze, and chill for 30 minutes. Makes ten portions.